The Ministry of Power, Works and Housing on Wednesday threatened to terminate the contract for the dualisation of the Abaji-Koton-Karfe road due to “negligence” by the contractor for five months. The Director of Highways Constructions and Rehabilitation of the ministry, Mr Dayyabu Mamman made the recommendation on Wednesday during an inspection by the Minister of State II for Power, Works and Housing, Suleiman Zarma. 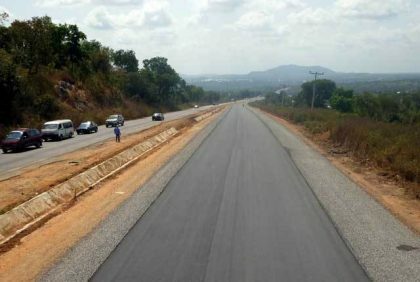 The News Agency of Nigeria (NAN) reports that the minister in the company of some ministry’s officials was on an inspection of the Federal highways projects in Kogi state, including housing projects. The project which is being handled by Bulletin Construction Company Ltd at the cost of N15. 1 billion is part of the dualisation of the Abuja-Lokoja Road; section III (Abaji-Koton-Karfe) C/No.5884. The 49.40 km road construction which began on Oct. 12, 2006, with an initial completion date of April 11, 2009, but extended completion date of March 12, 2014, has 159.72 as percent time lapse. “The site has been inactive since December 2017, laborers have not been deployed on site, I recommend for the termination of the project. “The project is giving us sleepiness nights, all effort to make them work to hasten the completion of the dualisation proved abortive for the past five months,’’ the Director noted while briefing the minister. Mamman, also the North-Central Zone Director noted that the contractor who has spent 12 years on the project with only 54.48 percent completion and has applied for an extension of the contract period. “The contractor has an advance payment of N1.6 billion only to pay back. None rendering approved services which the contractor has received payment for also amounted to the sum of N414.2 million,’’ he said. He identified another challenge facing the project as the “Rutting on the carriageway’’ report which the Department of Materials and Geotechnics has conducted pavement evaluation test to certify the reason for the failure but has not been submitted. The Engineer also ascribed delay in the project to the high rate of accidents on the road due to untidiness of the site. Mamman recalled that the contractor has been issued warning letters for poor performance and series of meetings have equally been held with the contractor to encourage increase performance but it yielded no result. Meanwhile, the company’s site agent, Mr Peter Omenye confirmed that the contract was abandoned because of labour related issues concerning workers salaries and entitlement. According to him, the workers have refused to work until they are paid all their entitlements. Reacting to this, the minister noted that there was every reason to terminate the contract because the contractor has not been on site for five months because of domestic issues. “It is not because we have any issue with them, we do not have any issue with them rather they have issues with their employees; I understand that they have not been paid salaries or allowances. “We do not owe, so we want construction to continue, we have no reason to be held hostage by any contractor in an event where we are not in default. However, Zarma who is also a Surveyor noted that in terms of contractor’s conditions, the ministry would go into the documents to look at the contractor’s conditions before making a categorical statement. Zarma also inspected the dualization of Abuja-Lokoja road, section IV (Koton-Karfe-Lokoja) Obajana junction, C/No. 5885 being handled by Gitto Construction Company with 61 percent completion. He lauded the road work progress, emphasizing that there was the fulfillment of President Muhammadu Buhari’s commitment to fixing infrastructure deficit in the country. He said road project was always costly due to the outsourcing of raw materials such as granite and cement including conducting a soil test before actual project execution commenced. NAN reports that the percentage completion of the project being handled by Dantata and Sawoe construction Ltd. as at April 2018 is 90 percent while the financial expenditure as at January 2017 is 88 percent.